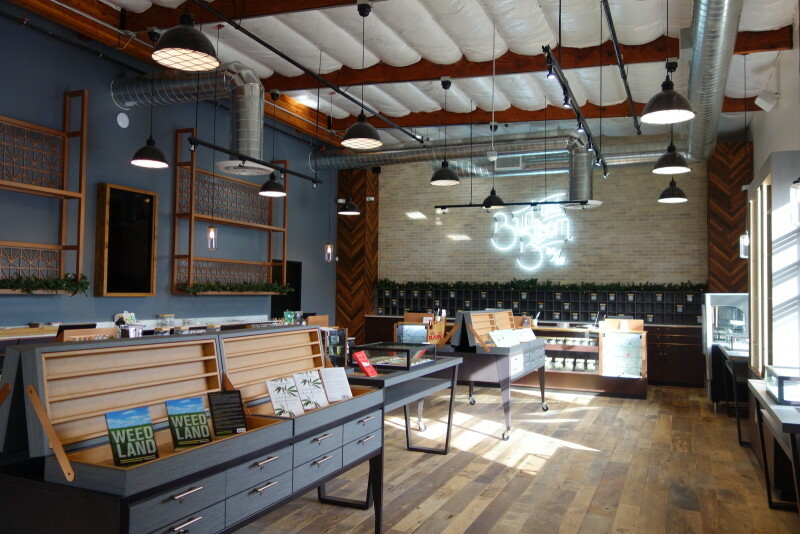 Recently, CalCann Holding’s pet project, the Santa Ana dispensary Bud and Bloom was featured in a Leafly magazine article entitled, “The 10 Most Beautiful Cannabis Dispensaries in America”, where it was highly praised for its industrial chic design. Bud and Bloom is one of two dispensaries that have been opened up in California by CalCann partners Aaron Herzberg and Chris Francy, and the attention it has gotten since its opening has spoken volumes about CalCann’s ability to open up quality marijuana dispensaries in California. Characterised by its exposed pipes, seek lighting, exposed brick walls and reclaimed wood floors, Bud and Bloom brings class and sophisticated design to the dispensary that its top customers are looking for. The customers of Bud and Bloom can enjoy speaking with a knowledgeable budtender who stands behind a marble countertop while browsing the dispensary’s cannabis selections through an iPad menu. CalCann Holdings partners Herzberg and Francy are naturally happy to see the dispensary gain such attention by Leafly if is this hope that through their example, they can set the tone on the design and delivery of both medical and recreational marijuana dispensaries. CalCann Holdings has become experts in starting up a marijuana business in California. Not only have they led by process and design, but by creating CalCann, they have committed to providing their expertise to marijuana entrepreneurs who want help navigating the legal marijuana industry in California. By providing expertise in real estate, investments and most importantly the legalities of the industry, CalCann represents a one-stop shop for getting all you need in place to start up a legitimate, often turn-key legal marijuana business. CalCann partners Herzberg and Francy hope that their Bud and Bloom dispensary can serve as a strong example to those who are interested in getting into the marijuana business themselves. Being the 11th dispensary to open in Orange County, Bud and Bloom, Herzberg and Francy’s second dispensary, opened up amidst the passing of Proposition 64. It was certainly a statement towards the current events that were happening in the United States election back in November; it showed that the legal marijuana industry wasn’t prepared to cower in light of a new anti-pot president. Bud and Bloom is located at 1327 East Gertrude Place in Santa Ana. You can take a look at the reviews of the dispensary through Google, Leafly, Weedmaps and other sites who permit the review of marijuana dispensaries. CalCann Holdings is a trusted source for marijuana entrepreneurs who are interested in creating similar success as the partners are seeing with Bud and Bloom.